If there’s one thing that requires double and even triple batches around here, it’s muffins. As soon as the muffins come out of the oven, the scent gently wafting to all corners of the house, my family transforms into a school piranhas. Any remnants of the baked morsels are stripped from the cooling rack in minutes. 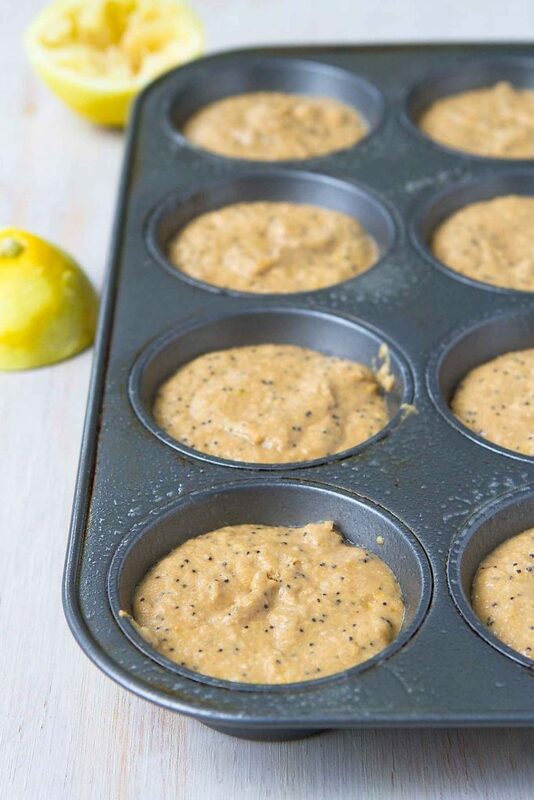 These healthy lemon poppy seed muffins are no exception, which is exactly why I make extra batches to stash in the freezer. I don’t know if it was the bright lemon flavor, the slight crunch of the poppy seeds or the light as air quality (thanks to the oat flour), but these quickly became some of our favorites muffins. And that’s saying something because we are firm devotees of banana nut muffins and carrot muffins. I’ve used oat flour in baked goods before, namely whole wheat scones, but I typically mixed the oat flour in a 50-50 combo with whole wheat pastry flour. In fact, if you do some googling, you’ll find that most bakers recommend mixing oat flour with another type of flour. 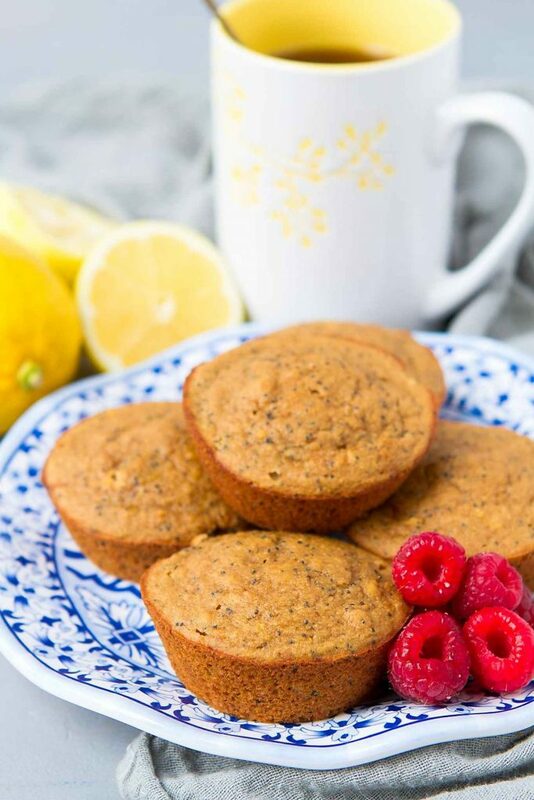 But I was curious about what would happen if I used oat flour exclusively in these easy lemon poppy seed muffins. The result? 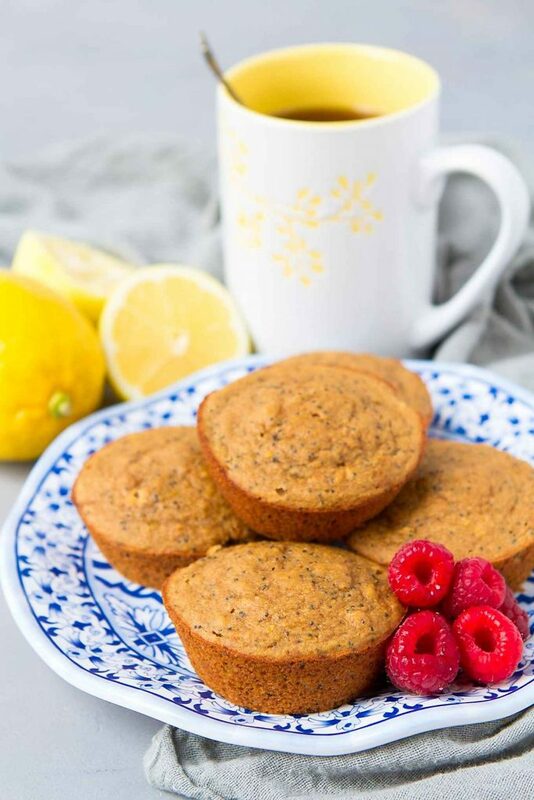 Light as air, moist lemon poppy seed muffins that also happen to be gluten free and healthy. Sold! How do you make poppy seed muffins? This recipe follows the basic formula that I used for healthy muffins. Start by whisking together the dry ingredients – this case, that’s oat flour (more on that later), baking soda and salt. 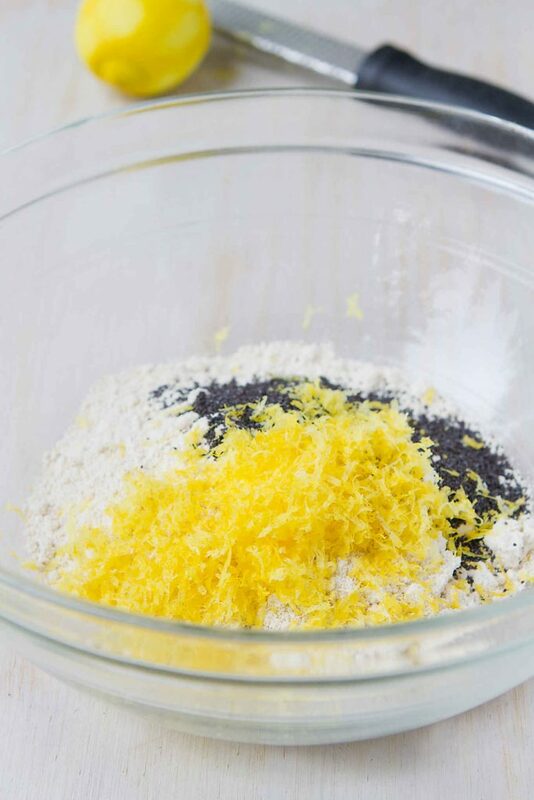 Stir in any extra spices or dry flavorings, such as poppy seeds and lemon zest. Stir together the wet ingredients – yogurt, applesauce, egg and lemon juice. Combine the wet and dry ingredients, stirring until just combined. Over mixing makes for tough muffins. Scoop the batter into prepared muffin tins and bake! Serve, store in a airtight container or freeze for later. What are the benefits of oat flour? If you follow a gluten free diet, oat flour is a great option for baking. Be sure to use oat flour that is certified gluten free, such as this one. If making your own oat flour (more on that in a moment), use gluten free oats. Oat flour boasts a plethora of nutrients, including fiber, protein, phosphorous, magnesium, iron, potassium, zinc and others. Oats and oat flour have been shown in studies to lower cholesterol levels and reduce the risk of heart disease. How to make oat flour – Simply place the oats in a food processor and mix until it reaches a very fine consistency. To remove any leftover lumps, run the flour through a sifter. Preheat the oven to 375 degrees F. Lightly coat a muffin tin with cooking spray. In a medium bowl, whisk together the oat flour, baking soda and salt. Stir in the poppy seeds and lemon zest. In a large bowl, combine the applesauce, Greek yogurt, coconut palm sugar, canola oil, egg and lemon juice. Stir together until the mixture is smooth. Stir the dry ingredients into the applesauce mixture until combined. Do not overmix. Scoop the muffin batter into the prepared muffin tin. Bake until a toothpick inserted in the center of one of the muffins comes out clean, 12 to 14 minutes. Allow the muffins to cool in the tin for 5 minutes, then transfer to a rack and allow to cool completely. Serve or store in an airtight container. I haven’t come across coconut palm sugar and haven’t seen it in my local stores, though we use very little sugar except in baking, and even then I cut back on the recommended “dose.” As a result, I’m not often in that department. I have got ordinary white sugar, brown, yellow and demerara sugars, and raw sugar. (Sounds as if we don’t use much sugar, doesn’t it?) However, in the fairly isolated are where we live, I don’t really expect to find coconut palm sugar.Does it matter? What substitution would you suggest, please? Hi Annie, you can either buy coconut palm sugar on Amazon if your grocery store doesn’t carry it or you can substitute regular brown sugar.